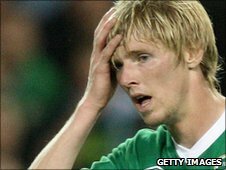 Bristol City's on-loan forward Andy Keogh has returned to parent club Wolves for treatment on a back injury. And the Robins will not be looking to bring the 24-year-old Republic of Ireland international back to Ashton Gate on a permanent deal in the summer. City have not given an indication of whether Keogh could return to the club for the end of the season. "When you look at the types of forward we've got he's quite similar," boss Keith Millen told BBC Radio Bristol. "I'm looking to get a balance to the squad and have different options in different areas." Keogh arrived at the Championship club in January and has scored one goal in his nine games. Keith Millen is Geoff Twentyman's guest on BBC Radio Bristol on Friday, 15 April. If you have a questions for the City boss send it in using the form here .